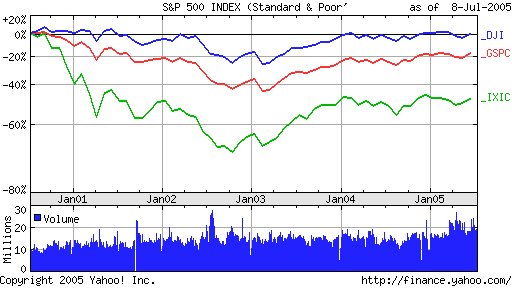 Above we see a two year chart of the three major US indexes, the Dow (blue), the S&P 500 (red), and the NASDAQ (green). We notice right away that the three traces have a lot in common. They go up and down in almost perfect synchronization. The amount they go up and down is called the "volatility." For most investors, volatility is bad - it makes one very nervous. A more volatile price graph will bounce up and down a lot more, and be a lot more jagged than a less volatile price chart. The next thing we notice is that the NASDAQ, the green trace, goes up higher and down lower than the other two. The NASDAQ is more volatile than the S&P and the Dow - the highs are higher, and the lows are lower. This is particularly obvious if we look at a five year chart instead of the two year chart above. 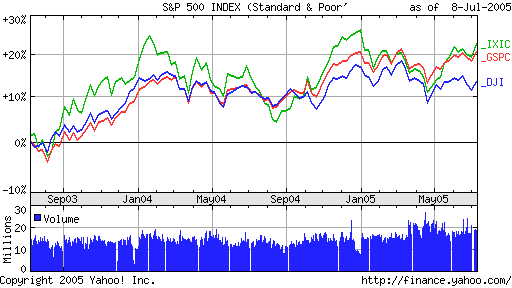 Above we see a five year chart of the three major US indexes, the Dow (blue), the S&P 500 (red), and the NASDAQ (green). This chart starts right around the time of the Internet stock collapse. Here we see that the NASDAQ dropped enormously, and in the last five years has regained only about half of its former peak. The S&P dropped considerably less, and is at a bit better than 80% of the former peak. The DOW, which doesn't have any Internet stocks in it at all, has almost completely recovered. This is the five year story. Two charts up, we see that the two year story is that your money would have grown the fastest with the NASDAQ, and nearly as fast with the S&P, but with far less volatility and nail biting. If you're an adrenaline junkie, the NASDAQ is your index. For the rest of us, the S&P 500 is a bit calmer. We can measure volatility of a stock or commodity. All by itself, the raw volatility doesn't tell us much, so instead we measure the volatility of a particular item relative to the S&P 500. This is reported with a number called "beta." The S&P 500 is arbitrarily assigned a beta of 1. If a stock goes up and down half as much as the S&P, its beta would be .5. If the stock goes up and down twice as much as the S&P, its beta would be 2. The higher the beta, the higher the risk. The higher the risk, the higher the potential profits, and the higher the potential losses. Just at a glance you can see that the NASDAQ has a beta greater than 1. In the two year chart above, we see clearly that, compared to the S&P, the NASDAQ highs are higher and the lows are lower. In the two year chart above, we're measuring the percentage change in each index, not the dollar change. If you buy 91 day T-bills and hold them until they pay off, the volatility of your investment is 0. There's almost no risk - only the risk that Washington and New York get nuked - and the payoff is low, typically 2 to 3 percent. So, now we see that there are available to us several investment strategies. We can choose low risk low return, moderate risk moderate return, or high risk high return. How do we pick? Traditionally, one says that if you find yourself with a large sum of money due to a one-time event, say an inheritance or a large divorce settlement, you should probably use a low risk low return strategy. You cannot afford to lose this money, as if you do you'll never get another chance. If, on the other hand, you could lose the money and recover, then you can consider a high risk high return investment. For most people who work very hard for their money and can continue to save, but only a fraction of their income, an appropriate strategy is low to moderate risk and intermediate return. Suppose you put all your money into only one stock, say General Motors. This would be the 'all your eggs in one basket' theory. GM might have a really good year, they might have a really poor year. In any case, you're now married to GM. It stands to reason that this would be a relatively risky investment strategy. If GM happens to have trouble, you have trouble. Now, suppose instead you bought equal dollar values of shares in GM, Microsoft, Alcoa, Wal-Mart, and Disney. If we found ourselves in a big recession, then all five of these stocks might go down together, but recessions don't last forever. In normal economic times, these stocks are all in different industries, and it is very unlikely that they will all move in identical directions. By virtue of your diverse investments, you are shielded from the mistakes or bad luck of any single company or industry. If you also keep some of your money in bonds, you're also partially shielded against poor economic times: as we've seen, when stocks go down, bonds tend to go up. So, the basic idea of a portfolio is to spread your money around. This will most likely greatly lower your risk. You have to be a bit careful about how you pick. If your stocks were GM, Ford, and Chrysler, you are not really as diversified as you might hope. These are all primarily in the automotive industry, and their share prices will tend to track each other fairly closely. You don't really have much diversification here. The idea of a diversified portfolio is that some of your stocks may go down, but others will go up, and overall you'll do pretty well. An example of a really well diversified portfolio would be to own a bunch of shares that was exactly the same as the shares that make up the S&P 500, plus perhaps own some bonds and real estate funds if you're worried about recessions. Since there are 500 different stocks that make up the S&P 500, this sounds pretty much impossible. Actually, it's quite easy. We'll see how to do this in Part III.